Twitter is one of the most powerful social media platforms there is. As a matter of fact, as of the first quarter of 2018, the microblogging site boasts of 336 million monthly active users. This is probably one of the reasons why Twitter has become an effective catalyst for launching and influencing initiatives for social change. An excellent example of this would be the controversial #MeToo phenomenon and the epic #MarchforScience. On the contrary, what happened to animal rights activist PETA, was an entirely different story. PETA or the People for the Ethical Treatment of Animals posted a tweet encouraging everyone to put a stop to frequently used idioms that they deem anti-animal and instead rolled a suggestion of animal-friendly alternatives. “Words matter, and as our understanding of social justice evolves, our language evolves along with it, ” PETA tweeted. Check out some of the suggested animal-safe phrases, which according to PETA will help remove speciesism from your daily conversations. Unfortunately, PETA’s tweet did not sit well with people on Twitter who were quick to shoot down the animal welfare organization. There are some who poked fun and volunteered their own animal-friendly idioms. “Hold your horses @peta, this is pig-headed of you to think you have the lion’s share of the idioms. Great, now that’s the elephant in the room. I better quit cold turkey before I get ants in my pants…” tweeted @Jmunee19. There were some tweeters who emphasized that, as a matter of fact, the PETA-approved idioms could literally be harmful to animals. “If you think that’s bad, overfeeding a horse is VERY serious. Horses will not stop and overeat to the point of bloating, which can cause Colic (blockage of the intestines) and possibly DEATH. For shame Peta, for shame 😏,”@TJskillz169 tweeted. 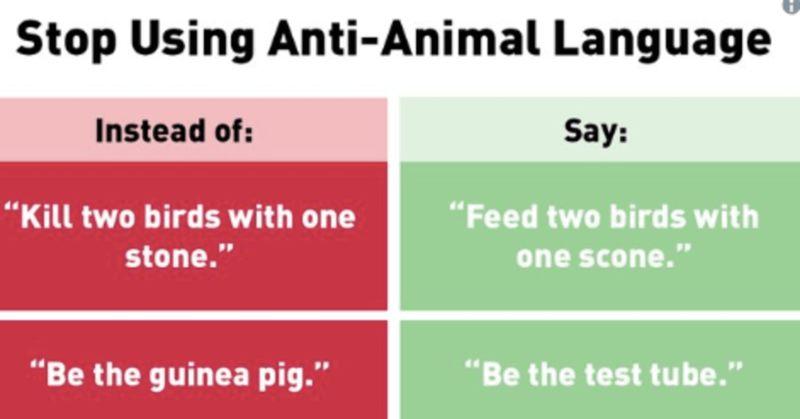 However, people were especially angry over PETA’s statement that compared the animal-related idioms to racist, homophobic, or ableist language, with some going so far as to call the action ridiculous, useless, and borderline offensive. “Hi, @peta. As someone who has had homophobic slurs shouted at him and seen individuals physically threatened and beaten while anti-LGBTQ epithets were hurled, your stupidity is not even laughable— it is offensive to equate common animal idioms to racism, ableism, or homophobia,” @AnthonyMKreis tweeted. Some vegans spoke out and said even they do not share the same sentiments with PETA on this one. “Animals aren’t offended by human language. I’m vegan and this is pointless,”@ScarsUnseen24 posted. Others were suggesting a conspiracy theory that PETA may actually be just a stunt by the meat industry to hate vegans or that the organization’s real biggest mission is to guarantee people would never take vegans and vegetarians seriously. “Do you ever wonder if PETA is a false flag set up by Big Meat to make everyone hate vegans?” tweeted @bethanyrutter. To make matters worse, PETA tweeted again as a direct response to the online flak it is getting. “To the haters: with so much negativity in the world, why not lighten up and use language in a way that encourages being kind to animals? To everyone else: add your own anti-speciesist phrases below!” PETA said in another tweet. To put it gently, this latest tweet was not received positively by the Twitter community as well. PETA has been campaigning for kinder vegan- and vegetarian-friendly idioms for many years now, requesting schools and teachers not to teach animal-cruel phrases to children, which they believe perpetuate violence and abuse of animals. On its website, PETA explained that although the idiomatic phrases sound harmless to many people, they actually have deeper meanings that can be confusing to students when it comes to how humans should treat animals around them and can even be teaching them to normalize abuse. By teaching the new animal-friendly phrases to students, teachers are helping to build a generation that has a more positive relationship with animals. However, the latest controversial tweet about the topic was inspired by and comes in light after an article entitled “How the rise of veganism may tenderize fictional language” by Shareena Z. Hamzah of Swansea University was published in The Conversation. According to Hamzah, who is an academic researcher from the United Kingdom, metaphors involving meat could gain an increased intensity if the killing of animals for food becomes less socially acceptable. She further expounds that if veganism compels people to confront the realities of food’s origins, then this increased awareness will undoubtedly be reflected in our language and our literature. Unfortunately, this is not the first time Twitter has been outraged by PETA. In 2017, British YouTube vlogger Calum McSwiggan lashed out on his Twitter posts and discouraged people from donating money to the animal organization.